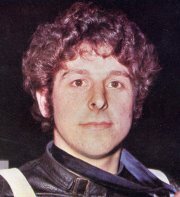 Malcolm was a good all round motor cyclist when he did a few laps at the Eastbourne Training School at Arlington in 1970/71. By the end of April he was in the Eastbourne Second Division team. He was so sensational he caught the eye of many British League teams including Cradley. However he only had two matches for the Heathens in 1971, the first was at Reading on 3rd May when he scored 5+1 from 5 rides, he made his debut at Dudley Wood the following week, 8th May, he scored 2 points from 3 rides and that was the last time he rode fot the Heathens! In 1972 retained by Eastbourne he joined Oxford and rode there for 18 matches to gain an average of 6.14. 1973 saw him again at Oxford this time doing a full season for an average just below his previous year with 6.09 from 36 matches. 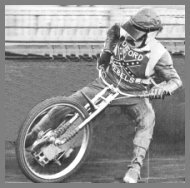 In 1974 he had a split season with Poole gaining an average of 8.36 from just 3 matches and Leicester for 6 matches for an average of 4.18. He was a temperamental young man and after a run of poor performances for Leicester he retired during the 1974 season.